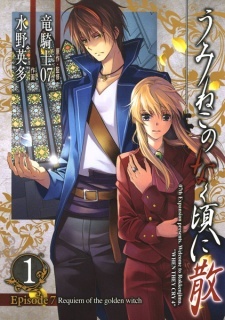 Adaption on 07th Expansion's popular visual novel. This episode features a new detective, a man called Willard H. Wright, who will uncover several truths about Rokkenjima's murder mystery. We will also get to know Lion Ushiromiya, a mysterious new member of the Ushiromiya family. Umineko no Naku Koro ni Chiru - Episode 7: Requiem of the Golden Witch has been published in English as Umineko WHEN THEY CRY Episode 7: Requiem of the Golden Witch by Yen Press in 3-in-1 omnibuses since December 19, 2017.